I don’t really follow tennis but when Naomi Osaka became the first tennis player born in Japan to win a Grand Slam championship, I welcomed the news especially when the whole nation was getting fed up with bad news in sports like bullying and harassment by those in power, although, as pointed out by many, Naomi’s victory was somewhat overshadowed by Serena Williams” row with the umpire. But I think she handled the situation elegantly and charmingly. This past weekend, Naomi was interviewed by a U.S. TV show and right after that she posted a comment on Twitter, saying “Look who I bumped into” with a picture with Djokovic. 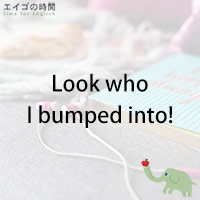 To bump into someone means to meet someone you know unexpectedly. Naomi and Djokovic bumped into each other. Their meeting wasn’t planned. It was totally by chance. Previous Post 不幸中の幸い – It could have been worse. Next Post ほんとにうんざり – I’m really fed up with this.